I justed signed up for the 1 week Artisan Baking I class at San Francisco Baking Institute. I'm excited and anxious about the class. I've been baking bread for many years, but just for my family, and lately have branched out into sourdough. Although sourdough breads are not covered in this first course, is there anything I should do before the class to prepare? I did a weekend course at SFBI early this year after many years of baking entirely on my own, with no formal training, just like you. I was very excited and it turned out to be a fantastic experience. I really don't think you need to do anything to prepare. Just enjoy it! I would love to return at some future point myself. David Snyder attended both SFBI Artisan I and II. I believe longhorn attended Artisan I about a year later. Here's the link to David's blog which gave day-by-day details about his experience at Artisan I. Longhorn also did a blog, which would show up in the search bar. It should give you an idea what to expect - other than having an absolutely wonderful learning experience! Thank you all for the links/info. I'll read through them to get a better idea of what the week will hold. I'm really looking forward to coming away with lots of good experience and bread baking know-how. Being able to make up my own bread formulas and understanding how the ingredients work together is one of my goals in this endeavor. Congratulations! You are going to have a wonderful experience and learn a ton. The only advice I'd give regarding preparation (besides wearing shoes that will be comfortable for standing for extended periods) is reviewing baker's math, if you are not already comfortable with it. Do you know who the instructor is for your workshop? Thanks for the words of encouragement. They haven't told us yet who the instructor will be. It might be worth an email back to them, as I received a welcoming email with details re: what to wear, lodging etc. I could take BART everyday from Martinez, BUT I'm not up for being on the train at 5 AM to ensure I get there at 7AM (too old, too lazy, too smart?). I'll be looking to stay at a hotel near the school. I understand they have SFBI student rates for hotels they list on the SFBI website(good thing because the hotels near the airport are pricey). In which hotel did you stay during your class? The hotels that SFBI suggests all have a free shuttle service to and from the SFBI. We stayed at the Larkspur Landing, which happens to be where we usually stay when visiting SF. It's a fraction of the cost of most hotels in the city, and there is a Peet's and a really good little Vietnamese restaurant right on Grand Avenue in South SF. I am a big fan of SFBI. I am confident you will have a wonderful and productive experience! David's blogs cover almost everything. I deliberately kept mine a bit simpler and tried to focus more on things David didn't talk about. I think reading/scanning them all will have you very prepared for what you are about to experience. For me it was not so much the "facts" but the hands on experience that really influenced my baking. Making 20 to 40 loaves a day for a week with perfect dough is really helpful to knowing what baking CAN be like. I stayed at the Staybridge and found it delightful. It is only a couple of blocks from a BART station and is conveniently across the street from a grocery store and shopping area with lots of restaurants. Your room comes with a stove and microwave and dishwasher and dishes, etc. so you can cook as much as you want. The kitchen equipment is a bit limited but adequate for most purposes. They also had free breakfast and dinners when I was there. Lunch is included at SFBI. I took some of my extra loaves home each day and gave them to the hotel staff. I look forward to hearing how your experience goes and what has changed. When is your course? Thanks for your reply. The class is offered from January 21 thru January 25th. I'll be sure to look into the Staybridge Inn as it's location sounds ideal for me. Having a kitchen available will certainly make evening meals less expensive during my stay - but then again, having access to restaurants nearby may be easier if I'm completely burnt out after a full day. I took Artisan I last May and absolutely loved it. I gained confidence in my dough handling techniques, learned what dought felt and looked like at various stages of development, and learned a lot about scoring. Making 40-50 loaves in a week allows reprtition and practice. The classroom time let us sit down for a change, and learn more. I stayed at Larkspur Landing too. Don't believe the 0.6 mi distance unless you have wings. I walk quickly and it took.me more than 20 mins to walk to SFBI. Fortunately a kind classmate gave me rides the rest of the week. I too enjoyed the 15 min. Walk to "south city" for dinner. Ate vietnamese, italian, and found a little dumpling shop. Lots of choices at wide price range. I made a point of getting back before dark since I was by myself. Found a mexican grocery. Otherwise no food source for cooking since I was without a car. The hotel had yogurt and hard boiled eggs I could take to add protein to the incredibly delicious breakfast pastries at SFBI. I also gave loaves to the hotel staff, and they took them gladly. I should have started giving them sooner. I received pieces of cakes from the professional class. What do you do when you make two cakes a day? The next week was chocolates, so I got to smaple those from the instructor reviewing recpes in advance. These are unadvertiysed benefits! That was may. What the prof class be studying in January will detemine what they give away. My instructor, Mac, was excellent. Knowlegeable and encouraging. David's and longhorn's posts were very helpful to me. Just heard back from SFBI re: who's teaching - it will be either Mac or Miyuki. Either of them seemed to be well thought of in the posts I've read, so I am really happy about that. was not there during my class so I never met her. Agreed that she gets great reviews. Based on observation while there the entire staff is fantastic. While I was there Frank Sally was training for competition in France and was turning out amazing breads daily with his assistant. Making the same breads over and over to get everything just right and automatic... That was truly inspiration. Below is one of the Teff loaves that Frank made. 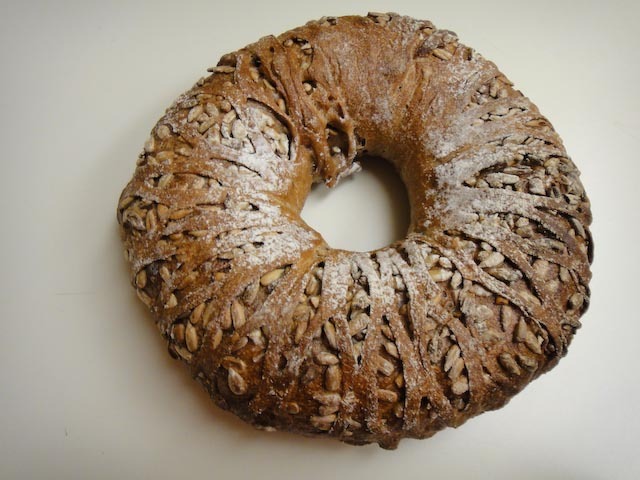 As you can see it is a wreath-like loaf made in pieces with a core loaf of sunflower seed coated teff and wrapped by an expanded, thin sheet of teff dough. It tasted great too! She was amazing. In addition to her help in fine tuning techniques, it was a pleasure watching her dough handling and baguette shaping. I can only compare her to a prima ballerina for the gracefullness of her movements.